'Representing Migrant Subjectivities in Contemporary Italian Literature and Cinema'. Conference Panel at the American Association of Italian Studies 2014 Conference, University of Zurich, May 23-25, 2014. 'Narrating Rome'. 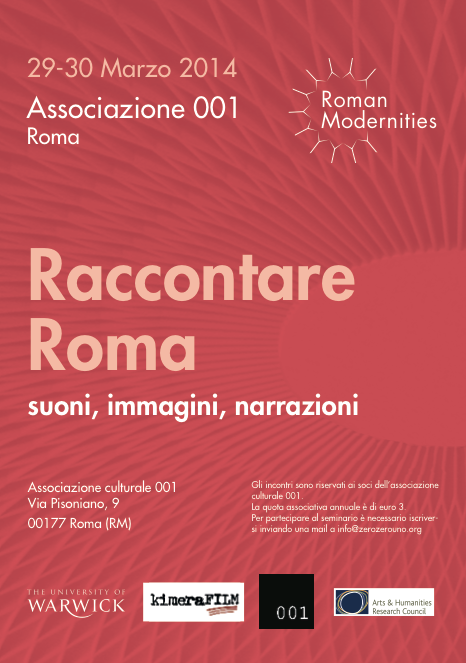 Seminar at Associazione Culturale 001, Rome, March 29-30, 2014. Programme . ‘Crossing Borders: Femininity, Visuality and Narrative on the Move'. Research Seminar, Centre for the Study of Contemporary Women's Writing, University of London, Dec. 11, 2013. Programme . 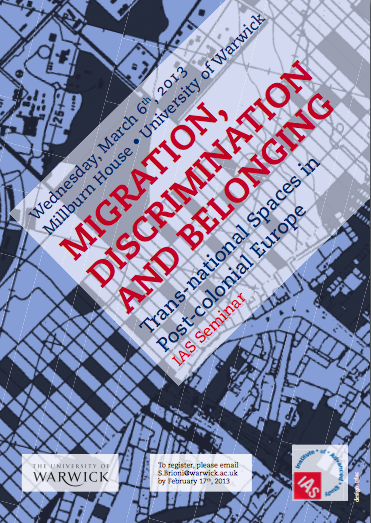 ʻMigration, Discrimination and Belonging: Trans-national Spaces in Post-colonial Europeʼ. Research Seminar, Institute of Advanced Studies, University of Warwick, Mar. 6, 2013. Programme . Website . Podcast . Wu Ming 2, ʻThe Historical Novel as a Means of Investigation: In Search of Narrative Truthʼ. Research Seminar, Italian Department, University of Warwick, Mar. 5, 2013. Programme . ʻThe Italian Trusteeship in Somalia (AFIS) and Beyondʼ. Research Seminar, Italian Department, University of Warwick, Jan. 18, 2012. Programme . ʻUrban Spaces and Migrant Writingsʼ. Research seminar, Italian Department, University of Warwick, Nov. 14th, 2011. Program. Programme . 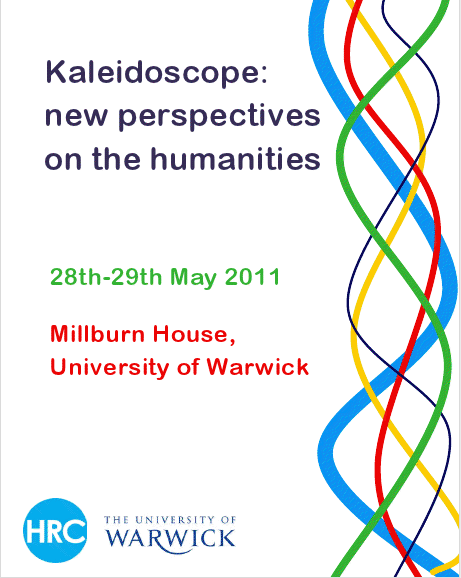 ʻKaleidoscope: New Perspectives on the Humanitiesʼ. Co-organised interdisciplinary and interdepartmental conference, University of Warwick. May 28-29, 2011. Programme . ʻMigrant Cinema and Writing in Post-colonial Italyʼ. Interdisciplinary and interdepartmental research seminars and pedagogic interventions, University of Warwick. Funded by the Institute for Advanced Teaching and Learning. Feb.-Mar. 2011. Programme . Podcast . Website . Arts Faculty Seminar Series 2010-2011. Co-organiser. ʻOLTREilMARginE: Festival di letteratura e migrazioneʼ, Brescia, Italy. Funded by Fondazione della Comunità Bresciana, CGIL, ANPI, Comune di Castenedolo, Comune di Borgosatollo. Curator, Director and Organiser, Nov. 10-14, 2010. Article in La Repubblica . Programme .